Ardsley, NY: Transaction Publishers, xxiv + 486 pp. "In reality, AFTA [Asian Free Trade Area] members are not free traders, at least, not among themselves… The problem is that AFTA is a vase with many serious cracks… [and] unless AFTA leaders take serious measures for AFTA improvements, AFTA is not very far from being “not that useful” to completely “useless.”"
Hafez adopts a multidisciplinary approach toward analyzing the development, functioning, and purposes of AFTA. 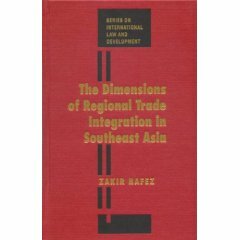 Building on research in political science, economics, and law, he systematically explores six dimensions pertinent to trade integration in Southeast Asia; these include policy, historical, structural, and legal aspects. The study thus reflects a richness that is unavailable to researchers working within a given disciplinary tradition. This eclecticism, however, comes with costs: Some of his arguments display an inadequate understanding of the nuances involved in the diverse literatures that he draws from. For example, this discussion of customs union (CU) theory draws exclusively on Viner’s (1950) original discussion on trade creation versus diversion, and hence ignores subsequent advances—such as the proposition of Kemp & Wan (1976)—that clarify conditions whereby CUs may in fact be Pareto improving. This colors his subsequent analysis, since common external tariffs are in fact often implemented in real-world CUs, AFTA included. Likewise, the work of Alesina & Spolaore (2003) outlines conditions where nations choose the optimal size of nations and, by extension, make decisions on economic integration. The tradeoff between the benefits of size versus the costs of heterogeneity is very relevant to the case of Southeast Asia, but this strand of the literature is not touched upon at all. It is in the discussion of the institutions and legal structures surrounding international trade law that Hafez comes into his own. For example, the discussion on the “substantially all” and “not on the whole higher or more restrictive” requirements of GATT Article XXIV  (pp. 48-–55) is erudite and informative, and is a clear reminder that any progress in multilateral trade liberalization needs to address the substantial divergence between economists’ theoretical conceptualization of RTAs as stepping stones, and the practical realization of these theoretical constructs (which often involve abuses). Likewise, his detailed discussion of two legal cases  that highlight the failure of the judicial disciplinary process of RTAs through the WTO (pp. 62-–74) suggests that Article XXIV compliance issues may have systemic roots, and hence require solutions that take into account the important political-economy reasons for such continued violations. The heart of the book lies in Chapter 5, which lays out the author’s analysis of the successes and failures of AFTA. Here, Hafez makes some apt points, but some arguments are poorly developed and, as a result, unconvincing. Take, as an example, the critique that AFTA accession should be used as a premise for democratic, market-based reform---the point being that open, democratic countries lead to prosperity (p. 227). The problem with this argument is that, first, it conflates political with economic freedom; and second, that it assumes that the correlation between democracy and GNP implies causality. Recent research (Barro 1996) in the democracy and growth literature has in fact questioned this latter relationship. As another example, consider Hafez’s assertion that (economic) size is relatively unimportant insofar as enhancing trade is concerned (pp. 233–234), drawing his inference by a comparison of the cases of Singapore and Indonesia. However, this ignores the dynamic effects of market size, as well as the substantial literature on the gravity equation that finds that GDP is a significant predictor of bilateral trade flows (Feenstra, Markusen & Rose 2001). Finally, the discussion of institutional defects in AFTA is somewhat misguided. Hafez’s claim is based on the fact that given that “AFTA has no institutional structure of its own [and] works under the institutional structure of ASEAN,” (p. 248) and since ASEAN lacks a clear-cut institutional structure---especially in comparison to bodies such as the WTO or EU---this therefore constitutes a deficiency in AFTA. The problem here is that Hafez misunderstands the manner by which institutions arise in order to solve collective action problems. Institutional evolution is endogenous to the idiosyncratic cooperative dilemmas present in each given historical circumstance; hence, a richer institutional structure is only necessary if such problems exist and need to be addressed. Unfortunately, Hafez gives us no reason (or evidence) to believe, ex ante, that AFTA faces such problems in its routine operation. In spite of these problems, Hafez has done a tremendous service with his detailed report card of the state of AFTA. While the strong claim that “AFTA thus far is a failure” (p. 206) probably needs to be tampered, he has nonetheless raised many relevant issues of concern in AFTA’s current operation and its direction forward. The book will prove useful to scholars seeking to enhance their knowledge of AFTA, as well as to policymakers contemplating FTAs involving economically and politically heterogeneous parties. Alesina, A. & E. Spolaore (2003), The Size of Nations. Cambridge, MA: MIT Press. Barro, R.J. (1996), “Democracy and Growth”, Journal of Economic Growth 1(1) (March): 1--27. Feenstra, R.C., J.R. Markusen & A.K. Rose (2001), “Using the Gravity Equation to Differentiate Among Alternative Theories of Trade”, Canadian Journal of Economics 34(2) (May): 430--447. Kemp, M.C. & H. Wan, Jr. (1976). “An Elementary Proposition Concerning the Formation of Customs Unions,” Journal of International Economics 6(1) (February): 95--97. Viner, J. (1950), The Customs Union Issue. New York, NY: Carnegie Endowment for International Peace. 1. These requirements are that RTAs must eliminate barriers on substantially all trade among members, and that they do not become more restrictive on trade than prior to their formation, respectively. 2. These are the Turkey---Restrictions on Imports of Textile and Clothing Products and Canada---Measures Affecting the Automotive Industry cases. 3. It should be noted that this is not an endorsement of poor business practices but rather that there is a need to recognise the institutional and cultural differences and tailor policies that work with situation-specific idiosyncrasies to enforce market discipline, yet are firmly founded on property rights and the rule of law. 4. Such as the first-generation ones á là Krugman (1979) and the second-generation ones exemplified by Obstfeld (1996). 5. This has been raised in detail by Bryant (1999). A redeeming point has been that Eichengreen does, however, devote an entire chapter (pp. 59-78) to discussing the bailing-in of the private sector, which necessarily includes foreign market participants. See additional reviews of this book and make purchases from Amazon.com. This review was published in the ASEAN Economic Bulletin in slightly revised form.